The UN has said "much more is required" to prevent the deaths of migrants fleeing to Europe after hundreds were reported dead in recent days. He called on states involved to "expand safe and legal channels of migration". Mr Ban said he was "horrified and heartbroken" at the latest loss of life. "A large majority of people undertaking these arduous and dangerous journeys are refugees fleeing from places such as Syria, Iraq and Afghanistan," he said. "The international community must also show greater determination in resolving conflicts and other problems that leave people little choice but to flee," he added. Mr Ban called on nations to observe international law on asylum requests, and not to "force people to return to places from which they have fled if there is a well-founded fear of persecution... This is not only a matter of international law; it is also our duty as human beings." He said: "This is a human tragedy that requires a determined collective political response. It is a crisis of solidarity, not a crisis of numbers." "The violence and instability in North Africa and the Middle East isn't just destabilising the immediate region but is starting to have a destabilising impact on other regions of the world too, including in Europe," Mr Earnest said. About 100 bodies have already been found and Libyan workers are continuing to search for 100 other people who are still unaccounted for. While most of the victims of Thursday's capsizes are thought to be from Syria and African countries, a Bangladeshi diplomat told the BBC that at least five Bangladeshi nationals, including a six-month-old baby, were among the dead. Media captionJames Reynolds in Austria: "It wasn't designed to transport human beings"
The headline in Austria's Kurier newspaper is stark: "Who will stop this madness? 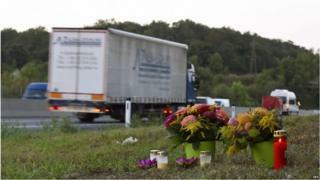 Refugee tragedy on the eastern motorway." Its main asylum centre, at Traiskirchen, is so overcrowded that hundreds have been forced to sleep outside there for weeks. Amnesty International recently said conditions there were "shameful". The government says it doesn't want that - but it says this problem can't be solved individually. It says Europe has to share the burden of looking after the refugees and migrants who arrive here every day. A record number of 107,500 migrants crossed the EU's borders last month. The UNHCR says more than 2,500 people have died trying to reach Europe so far in 2015, not including Thursday's deaths.